Known for its exciting reveals, CES has become a launch pad for automotive advancements. This year, autonomous driving and personalized mobility captured a lot of attention. And it wasn’t all talk – NXP was there with proof of concepts. If you couldn’t make it to see NXP at CES, here’s what you missed. #1. A single chip tunes in the many broadcast standards around the world. O ur new ultra-space-saving RFCMOS device integrates six ICs into one – a groundbreaking innovation for infotainment. The SAF4000 IC receives multiple different global broadcast standards, digital as well as analog. Because it’s a software-defined single-chip solution, the same chip can be used in cars around the world. OEMs simply adjust the broadcast with an end-of-line software update to meet the regional standards of each car. At CES, we showed how this new device seamlessly integrates with the i.MX 8 processor and next-generation Smart Class D Amplifier for high-performing infotainment systems. #2. Safety on the road, thanks to automotive radar and partner HELLA. 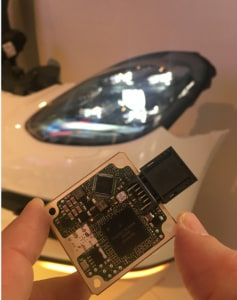 L ast year at CES, we announced the postage-size radar concept based on the new S32R27 radar MCU with the 77 Ghz RFCMOS Radar Front End that could be integrated “invisibly” as a cocoon all around the car. This year, we showed how it works. In this demo, HELLA’s next-generation radar systems with 360-degree surround view sensing was integrated on the front of a Porsche. When visitors walked in front of the car, LED lights on the bumper lit up and followed the pedestrian, illustrating how cocoon radar can pinpoint objects on the road. #3. This is what secure, personalized automated driving is like. In a mile-long route on Las Vegas city streets, passengers experienced a highly-automated (and engaging) ride-along. A voice-activated personal assistant helped the driver and passengers navigate the city, make dinner reservations at a restaurant, and even secure insurance for the driver and passengers. In collaboration with Microsoft, IAV, Cubic Telecom, Esri, and Swiss Re, passengers experienced how vehicle-to-x communications, artificial intelligence and cloud connectivity can change their driving experience. Cars securely “talk” to other cars and the infrastructure, monitor what’s happening in their surroundings to improve safety and individual cars adapted to different driver styles. NXP’s Intelligent Roadside Unit controlled a stoplight and communicated with the V2X-enabled car. 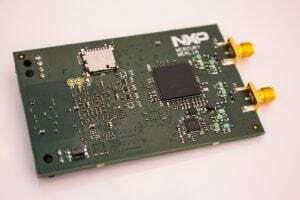 The new solution, powered by QorIQ LS208X processor and integrated with the RoadLINK V2X chip set, the S32V ADAS processor and long-range radar from RFBeam that incorporates NXP’s MR3003 77GHz radar transceiver and S32R radar MCU. #4. My car knows that’s a deer ahead on the road. Future cars can recognize and classify objects and they will have learning capabilities. In our NXP BlueBox demo, objects seen by the camera were classified in real time on the screen, illustrating the power of NXP’s vision processing and sensor fusion capabilities. #5. Rinspeed’s Oasis concept car loaded with NXP connected car goodies. 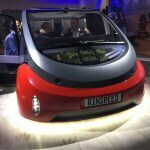 Each year, CES is the place where the next-generation Rinspeed car is launched, and thousands of people see it at HardRock Casino. Read more about this “garden plot on wheels for the urban jungle” that uses NXP’s BlueBox autonomous development platform, V2X and radar technology. You can also watch this video and see it in action. Our 2017 automotive story starts at CES … and this is just the beginning. We’re heading to Mobile World Congress and embedded world next. You can also follow us on Twitter to stay up to date! NXP is a top 100 Global Innovator: Big deal?